When your multipair system must meet the demands of travelling acts or permanent installation situations where the highest degree of durability is required, the choice is clear. Pro Co RoadMASTER Multipair Audio Snakes are built to withstand the night after night abuse of set-up and tear-down, providing you with a system that you can rely on. Each RoadMASTER stagebox is constructed of a 16 gauge steel connector panel and a heavy-duty 12 gauge steel U-channel enclosure designed for excellent shielding and protection of connectors. The stagebox is coated with black semi-gloss epoxy paint with white silkscreened channel identification numbers. 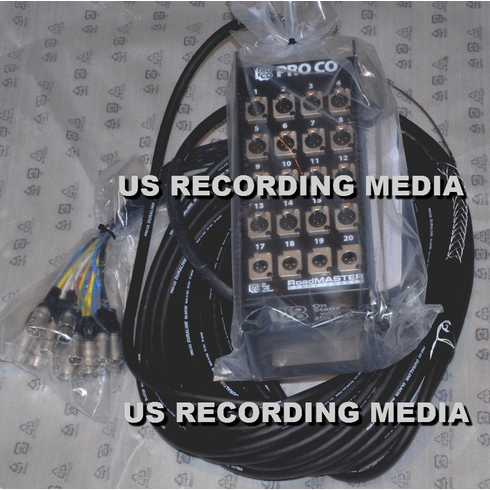 Mic inputs are Neutrik® NC3FQL-PW “Flat Latch” Female XLR connectors and returns are Neutrik NC3MQL-PW Male XLR connectors or Neutrik NJ3FP6C 1/4” T/R/S Panel Jacks (as designated). The Flat Latch female XLR panel-mount connector provides a smooth, snag-free connector field and is made exclusively for Pro Co by Neutrik. The stagebox is wired with CL2-rated PRO CO DURALINK Multipair Audio Cable to a 2, 3 or 4 foot Fanout (determined by total number of channels) with Neutrik NC3MX-1 Male XLR connectors and Neutrik NC3FX-1 Female XLR connectors or Amphenol® ACPS-GN 1/4” T/R/S Phone Plugs (as designated). The cable is secured to the stagebox with a heavy-duty wire mesh strain relief and a wire mesh cable grip is provided at the fan-out. The individual channels of the Fanout are protected with color-coded irradiated polyolefin shrink-tubing for long flex-life and easy channel identification.